SurfGuitar101.com | News: Stories with tag: "japan"
Surfer Joe Returns To Japan! 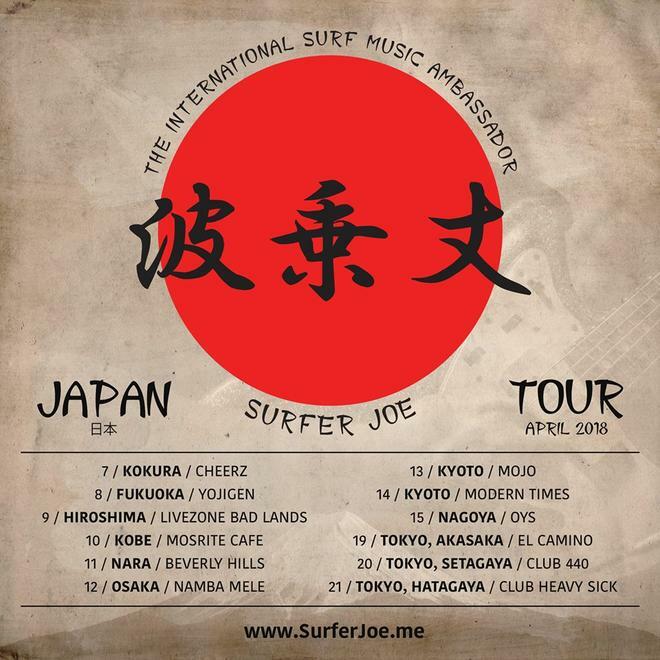 After the success of last year's inaugural Surfer Joe tour of Japan, the international Surf Music Ambassador continues to live up to his name and returns to Japan once again for an even longer tour! The 2018 tour will visit even more far-reaching locations including Kokura, Fukuoka, and Hiroshima and will be highlighted by performances from some amazing Surf colleagues including The Surf Coasters, The El Caminos, Lulufin The Woo Hoo, The WHYs, The Fuzziyama Surfers, The Surf Vader, The Palms, Switch Trout, BCV and more! In addition, on this tour Surfer Joe will be joined by a bi-coastal American rhythm section consisting of his longtime collaborator Jonpaul Balak (Insect Surfers, Tikiyaki Orchestra) on bass, and Vincent Minervino (Black Flamingos, Royal Pacifics) on drums!